Cognos is a Business Intelligence platform that allows authors to connect to almost any database, design a metadata model, and build reports and dashboards. These reports can be viewed in a number of formats, HTML, PDF, Excel, CSV and XML. While Cognos has its own portal system, these reports can also be attached to Sharepoint (MOSS). This post will detail how to embed FusionCharts v3 into Cognos reports using standard Report Studio objects. It assumes a basic level of understanding of Cognos Report Studio and HTML. FusionCharts allow authors to embed the source XML directly into the page. This will allow Cognos authors to use HTML Objects to programmatically generate the expected XML. Set the description of the HTML Object to FusionCharts.js so you know what it is in the future. Set the description of the HTML Object to [cciel lang=”html”]chartContainer[/cciel]. This can be achieved by combining HTML objects with repeaters. The [cciel lang=”html”]inThousandSeparator[/cciel] flag is important as Cognos will automatically add the thousands separator to numeric fields. Set the description of this HTML item to [cciel lang=”html”]ChartStart[/cciel]. Now we have to HTML items, [cciel lang=”html”]ChartStart[/cciel] and [cciel lang=”html”]ChartEnd[/cciel] next to each other. When the report is run, it will have all of the settings for the chart, except for the data itself. Now for the values of the chart. Create a query for your chart. 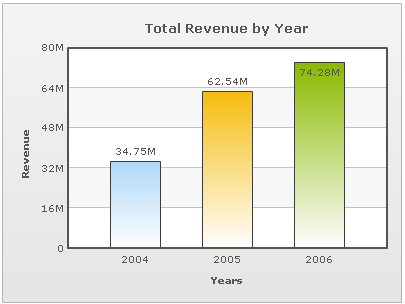 In this example, the chart should show revenue by years. 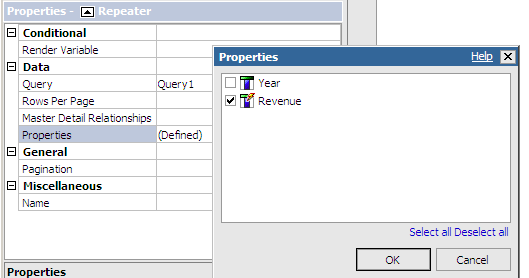 Revenue is formatted in the cube, so we’ll need to get rid of the dollar sign in the report. Drag a repeater between the [cciel lang=”html”]ChartStart[/cciel] and [cciel lang=”html”]ChartEnd[/cciel] HTML items. 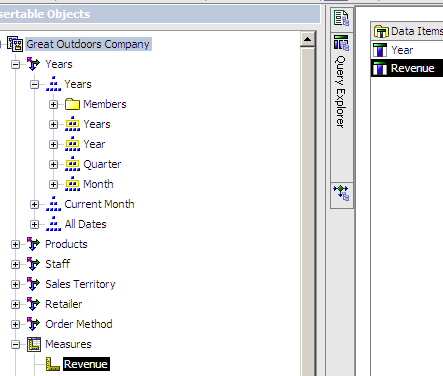 Set the query to the one you made previously, and put both items into the properties of the repeater. Name the HTML items appropriately, so you can reference them later if needed. That is how you can embed FusionCharts v3 into your Cognos reports. Do you like what you see? Note: Cognos saves the metadata of the reports as XML inside the Cognos database. This makes it very easy to share reports via email. Authors can simply download the XML and copy it into the clipboard and use the authoring tool to load it. This is a guest post written by Paul Mendelson. Paul has worked in the Business Intelligence field for 8 years. He currently works for Opisoft Ltd as a Cognos expert. He works at a number of client sites including the Road Safety Authority, Menora Insurance, Teva Pharmaceuticals, and a number of other companies. Paul also maintains a Cognos blog. Hi there… Does this work in Cognos 10 ?. I am struggling to get the example working under Cognos 10 and IE8. This should works perfectly under Cognos 10. This method simply generates the HTML that the client’s browser interprets into the graphs, so it will work in any version of Cogons that has HTML items and repeaters. 1. Are the files in a place the users can access? Just like images, the user needs to be able to reach the files with his browser. A good place to put them might be on a dedicated images server, or in the webcontents directory of the Cognos dispatcher. 3. Make sure the data is coming from a repeater and not a list or repeater table. Both lists and repeater tables function by actually generating a table and populating each cell accordingly. Repeaters simply dump the contents onto the page without adding any extra HTML tags. 4. The data should be in HTML, not in text items. Like with the lists and repeater tables, text items add extra HTML, in this case span tags. HTML items will simply return the data directly to the page without modifying it. 2. My PATH to http://localhost/FusionCharts/JSClass/FusionCharts.js is fully qualified. 4. Ensured that the data is HTML and not text items. Do you have working reportspec that you could post or send on ??? I’ll try to post a copy of the XML sometime tomorrow morning, but in the meantime a few other things to try. Packt Publishing is looking for Technical Reviewers on “FusionCharts: Beginner’s Guide”. I’ve been looking at using FusionCharts in Cognos for a couple of months and with assistance from Gerry a mate in IAG, we’ve been able to determine how to generate a multi line chart with a series name. I’m using the free samples so there were some false starts with labels but we’ve arrive. Otherwise it’s pretty good. Tip read the update notes in the readme! It’s kinda important. Great article! I hope there are some more examples about as I’d like to know how to pad the line to start a few pixels in from the Y axis. 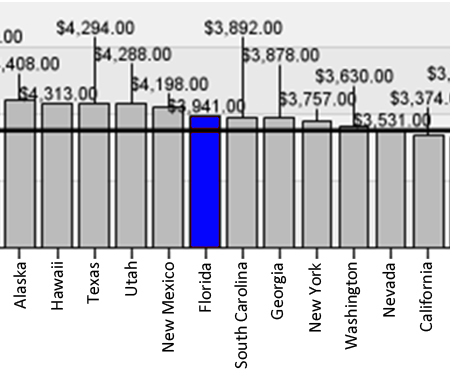 Here is an example: http://i.imgur.com/aM4gEYu.jpg In this example, I only need to show the data label for Florida. Showing all the other data labels in this chart makes it way too jumbled. Yes, it is possible to show only specific data labels by using and then setting showLabel=’1′ for the set you want to show the label(For Florida). 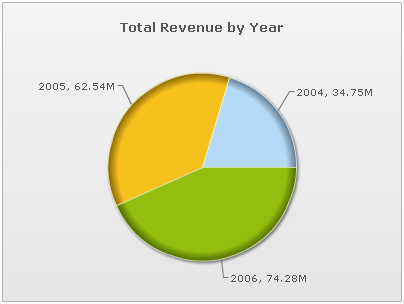 I have integrated fusion charts into Cognos 10.2. But, now all the data in Y axis is having the same value. And in Y-axis, I am getting the values like ‘NaN.00M‘. I have removed that by usin Yminval and Ymaxval property. 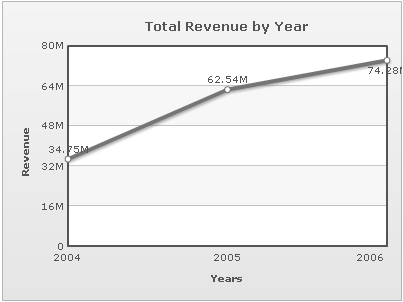 Revenue for each year is different, but I am getting the same bar level in the chart (and the values are ‘NaN.00M‘). Please help me out to resolve this problem. — Y axis will be displayed as NaN.00M and all bars will be displayed at the same level. Could you please post the detailed step-by-step instructions on integrating Fusion Charts in Cognos 10.2.1. Also, please mention where exactly to put the FusionCharts folder and the comparability of the browsers. The blogpost provides information required for integrating FusionCharts with Cognos Report. The similar step by step instruction can be followed for integrating with Cognos 10.2.1. If you are looking in for any specific segment for more detailed information, please do let us know. It will help us to add the relevant info to the blogpost. I appreciate your guidance in helping me out. I could able to implement it now and would like to know if we can create drill through links to get detailed data out of the charts? Any help regarding this is highly appreciated. The above blog shows solution when the charts were flash based. Now the charts are completely js. There is no swf files. How does this work? The swf files have been removed since we have deprecated the support for Flash. However, you can still follow the same steps as mentioned in the blog post to render FusionCharts with Cognos report. Do you have any error message in the web browser or in the console?